Though they’ve gained a bloodthirsty reputation for loving meat, piranhas are actually omnivorous fish originating from freshwater rivers in South America. While their sharp, tightly interlocking teeth strike fear in many a swimmer, in actual fact, piranhas rarely pose a significant risk to humans and are growing in popularity as aquarium pets – in places where they’re legal. Size: Most piranha fish reach a length of 6 to 10 inches when fully grown, though some wild piranhas reach lengths as long as 3 feet (18 inches). They have eye-shaped bodies, but some piranha fish have a bloated appearance that makes them appear more circular than ovular. Color: Most piranhas have silver scales with orange undersides. Under certain lighting conditions, the scales of a piranha may actually appear to glitter or reflect light. Variants: One popular pet variant is the black piranha, which has dark gray rather than silvery scales and piercing, bright-red eyes. Its cousin, the red belly piranha, features traditional scale colors but has a scarlet rather than an orange underside. While the piranha’s aggressive reputation isn’t wholly deserved, these fish should not be kept in the same tank as other fish species. However, some more placid individual fish may get along well with other small fish, provided they are well fed and won’t consider your other pets a snack. During their early lives, piranhas tend to be school fish, so young piranhas should be kept with other piranha fish. As they mature, though, most piranhas become solitary. Puffer fish are known for their ability to inflate their body to several times its normal size. 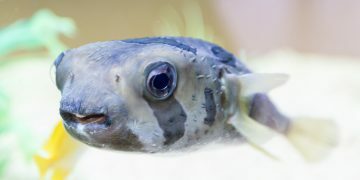 Learn more about how to care for this unique type of fish. 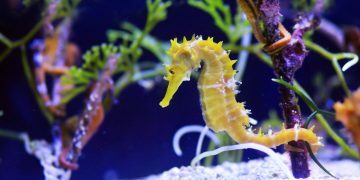 Feeding: It’s important to remember that these fish are omnivores; while they need (and love) meat, they must eat a varied diet to meet their nutritional requirements. Fresh or frozen worms are a favorite, and you’ll find plenty of freeze-dried options at your local pet store. The occasional chunk of fresh beef or chicken makes a tasty treat, but what’s most important is to include raw vegetables as part of your fish’s regular diet. Zucchini, spinach and chunks of uncooked potato make excellent choices. Feeding your piranha goldfish can lead to intestinal and systemic diseases and is not recommended. Tank Care: Piranhas are messy fish, producing significant amounts of waste. You’ll have to invest in a quality aquarium filter and change 10 to 15 percent of the water in the tank each week. 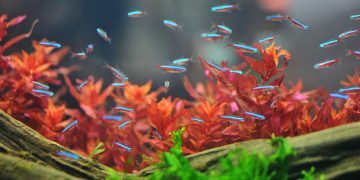 Experts recommend freshwater aquariums with a volume of at least 2 gallons per inch of fish size, per fish. Thus, an 8-inch fish needs 16 gallons of water; a pair of 10-inch fish would need a 40-gallon tank. Water should be kept in the range of 76 to 83 degrees Fahrenheit. Health Concerns: Pathogen-based illnesses are the greatest cause for concern. You can help your piranhas by disinfecting the tank thoroughly before introducing them to it. Common symptoms of bacterial, fungal and parasitic infections include a reduction in energy, discoloration, difficulty swimming, scale bleeding and lesions. Act quickly if you spot any symptoms to give your fish the best chance of survival. Life Expectancy: Well-kept fish can survive for 10 years or longer. Piranhas are illegal in a number of U.S. states. If you find piranhas for sale in Alabama, Alaska, Arizona, Arkansas, California, Colorado, Florida, Georgia, Hawaii, Kentucky, Louisiana, Maine, Massachusetts, Mississippi, Nevada, New Mexico, New York, North Carolina, Oklahoma, South Carolina, Texas, Utah, Virginia or Washington, don’t purchase them – you’ll be violating the law. If you live in a state, country or jurisdiction where the sale of piranhas is legal, expect a steep price tag. A single red belly piranha can run as much as $500.